The Konica Minolta Tower is situated 500 feet above the mighty Niagara Gorge and contains a boutique hotel (Ramada Plaza Hotel), restaurant (The Pinnacle) and an observation deck. The observation deck is located on the 25th floor and provides spectacular view of the Falls and or the Niagara Region from the observation deck. On a clear day visitors can see Toronto, Niagara-On-The-Lake and Buffalo from the observation deck. Visitors can take advantage of floor-to-ceiling, wall-to-wall windows that have been specially treated with a non-glare finish for optimal photo taking. The hotel is situated atop the Konica Minolta Tower Centre in the heart of the Fallsview Resort district. 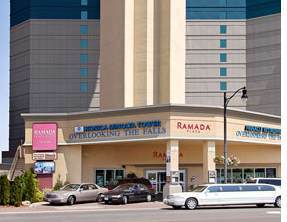 The Ramada Plaza Hotel offers a varied range of accommodations including rooms that overlook both of the mighty American and Horseshoe Falls. The Niagara Parks, the Horseshoe & American Falls, the Maid of the Mist boat cruise, Imax Theatre, and Niagara Parks Greenhouses and the new Fallsview Casino are all located within walking distance of the hotel. In house dining includes The Pinnacle dining room, which has recently under gone a major renovation and was featured on a new television show called “Restaurant Makeover”. The dining room has the closest and most spectacular panoramic views of the falls. All rooms at the Ramada Plaza hotel features floor-to-ceiling windows that provide a view of the Niagara Area or Niagara Falls, fridge, microwave, coffee maker, 25″ TV, iron, and hairdryer. The 25th floor Observation Deck is available to guests of the hotel as well day visitors who will enjoy as floor-to-ceiling, wall-to-wall windows that provide exceptional 360-degree views of Niagara Falls and the Niagara Region. Experience fine dining with the most exceptional fallsview in the city. The Pinnacle Restaurant features a new Gourmet Menu. The Konical Minolta Tower also provides complete wedding packages that can be customized to meet your needs. The Pinnacle Restaurant provides a panoramic view of Niagara Falls. An exceptional menu has been customized to include a variety of gourmet selections to suit every taste including the finest steaks, seafood and pasta. In March 2005, the restaurant underwent an exciting new makeover to further improve upon both the menu and dining room amenities. Early bird discounts and children’s menus are also available, valet parking is complementary. The Konica Minolta Tower is able to provide you with an intimate one of a kind wedding experience! This unique location is able to offer a ceremony, dinner, and luxury honeymoon accommodation all overlooking Niagara Falls. A personalized wedding consultant will be available to help you plan.